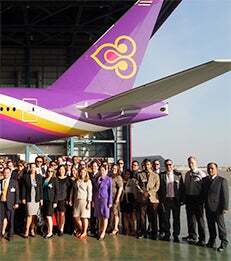 In January of 2014, a group of executive MBA students traveled to Ho Chi Minh City, Vietnam and Bangkok, Thailand on a Global Study Tour. Highlights of the program included meetings with representatives from HSBC, Cisco, Bank of Thailand and Thai Airways as well as factory tours of Nike and Siam Food. "I have found that the Global Study Tour (GST) really helps put what we learned in our introductory economics classes into better perspective," explained executive MBA student Bryan Harkins. "I think we often take the US business environment for granted. When we travel to emerging markets in our GST, we really get to see, firsthand, things like the effect of labor practices, government policy and trade practices on the business environment."